The perfect size for serving cocktails and mixed drinks. Celebrate your milestone birthday with 12 oz custom printed, reusable plastic stadium cups that guests can take home as party souvenirs. Your friends and family will love the custom touch. 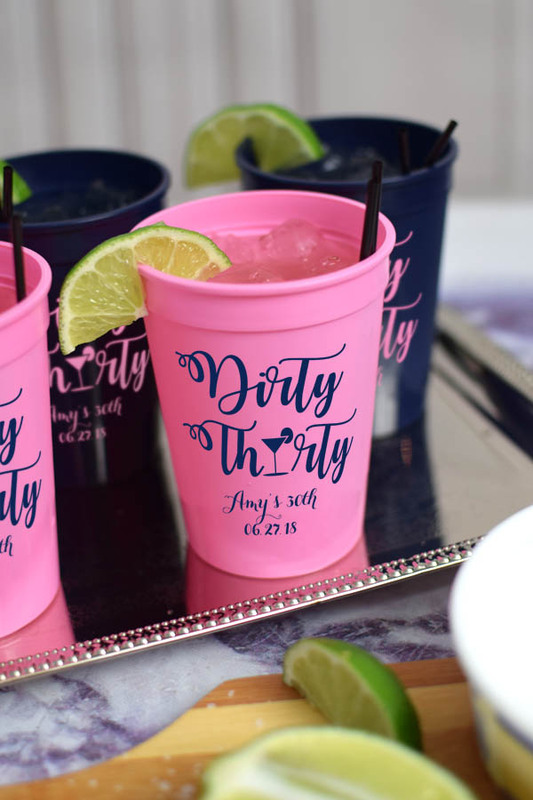 These plastic cups are personalized with an adult birthday design and your own custom message. The ideal size for holding cocktails and mixed drinks. Choose from a large assortment of vivid cup color options to match your party theme. Dishwasher safe in the top-rack. The perfect size for serving cocktails and mixed drinks. Celebrate your milestone birthday with 12 oz custom printed, reusable plastic stadium cups that guests can take home as party souvenirs. 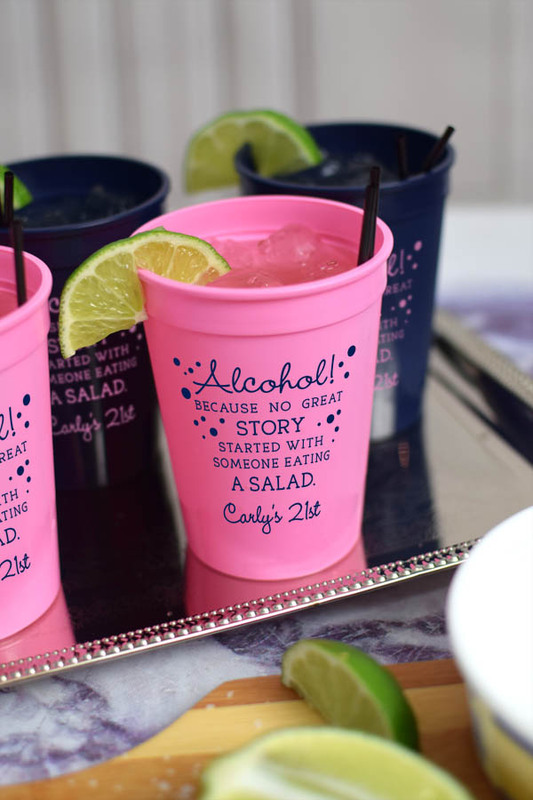 The 9oz Personalized cups made the party pop...I will definitely purchase them again. Good product. Thought the pink would be darker, but great otherwise. I am very pleased with my cups. They arrived sooner than expected, and I was provided with great customer service when ordering. The cups themselves are exactly what I wanted too. Would recommend! Super pleasant staff, helpful advice and fast shipping!! What are you waiting for, give them a shot!! A little smaller than I thought and half of the writing on the cups are missing towards the top. Overall they are just ok.
MWRI Response: A replacement order has been printed using larger cup size and shipped free of charge. I ordered the reusable stadium cups for my husband's birthday party and they turned out really cute! They are good quality and will be a special detail added to the party! I placed my order then realized I needed it sooner. I left a message and it was returned quickly and they were able to complete my order for when I needed it! Extremely happy. I ordered these to use as favors for a 50th birthday party. They are really nice. I recommend them. My cups are so awesome!! !They met my deadline to get them as as the work done on them was great!!!!! IÃ¢â‚¬â„¢m so happy with how the cups turned out, only wish they were a little bigger. I canÃ¢â‚¬â„¢t wait to use them for my birthday! Great little cups! They were a hit! Great product but expected cups to be bigger than they were! Party was great and cups were a great keepsake. Ordered theses cups for my birthday party and they were great party favor and everyone loved them. I love this company. I will use them again. I received everything as promised. No problems with the order. I love this company!!! My order was on time and perfect. I even received a email and call from them to make sure what I wanted on my cups was Accurate and told me what will make it look the best. I really loved the customer service. These cups were adorable and being able to have them personalized were a big hit with the birthday girl! I purchased the cups and had them personalized for my momÃ¢â‚¬â„¢s surprise 60th Birthday Party at our family lake house. They were a hit! Everyone enjoyed drinking their drinks out of them and had a gift to take home! They are good quality and have held up nicely in the dishwasher. Would definitely recommend. Thank you so much for doing an awesome job on my daughter's birthday cups. They look great. I will definitely order again. The cups were exceptional. Great value and excellent quality. They even arrived early. Would highly recommend TippyToad. After I received the cups I realized that I made the right choice for choosing you all to make the cups for my daughters 21st birthday. Thanks again for your help. Came faster than expected and they look amazing. Customer service was very prompt. I am very pleased with my purchase and will order again in the future.